The Kingdom of Montenegro (Serbian: Краљевина Црнa Горa / Kraljevina Crna Gora), was a monarchy in southeastern Europe during the tumultuous years on the Balkan Peninsula leading up to and during The Great War (WW1). Prince Nicholas of Montenegro, in 1906, issued coins in denominations of 1, 2, 10 and 20 pare. The 1 and 2 pare were bronze, the 10 and 20 pare were nickel. In 1909, silver 1 and 5 perpera coins were added, followed by 2 perpera in 1910. 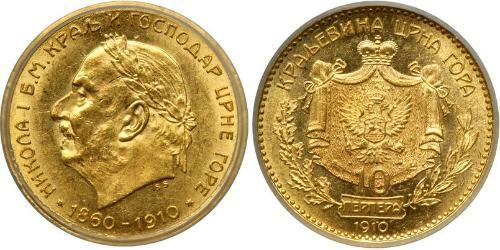 Gold 10 and 20 perpera were also issued in 1910, along with very limited numbers of 100 perpera coins. 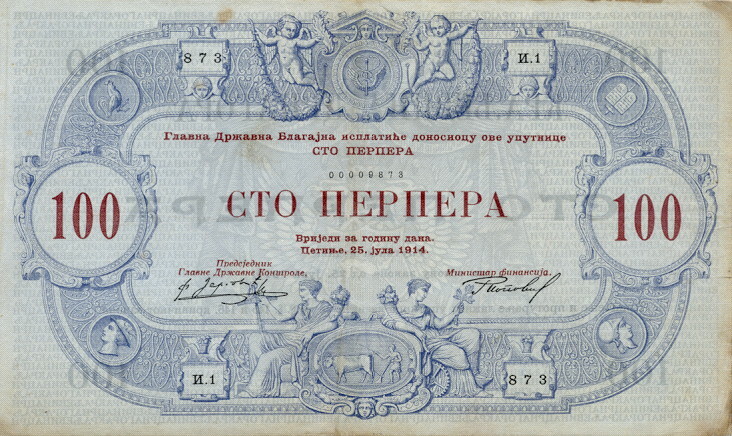 The perper (Serbian Cyrillic: Перпер; plural перпери) was adopted in accordance to the earlier Serbian perper, the currency of the Serbian Empire, to which the Principality, later Kingdom of Montenegro, considered itself to be a successor. 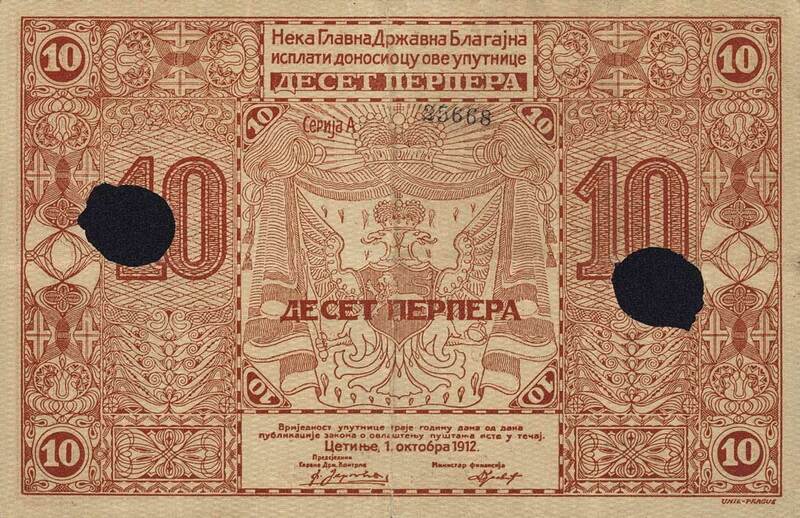 It was divided into 100 pare (singular para, Serbian: паре, пара) and was equivalent to the Austro-Hungarian krone. 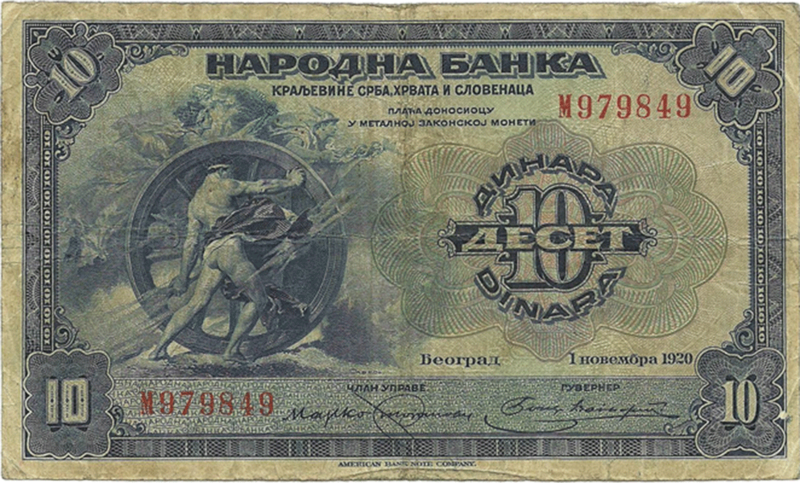 Banknotes were issued in 1912 by the treasury in denominations of 1, 2, 5, 10, 50 and 100 perpera. In 1914, the government issued three series of banknotes, in denominations of 1, 2, 5, 10, 20, 50 and 100 perpera. During World War I (1914-1918) Montenegro allied itself with the Triple Entente, in line with King Nicholas’ pro-Serbian policy. Accordingly, Austria-Hungary occupied Montenegro from 15 January 1916 to October 1918. During the Austrian occupation during World War I, government notes of the second and third series were overprinted by the military government district commands. In 1917, the Austrian army issued convertible vouchers denominated in perpera, perpera coins (Münzperper) and Kronen, with 2 perpera = 1 coin perper = 1 Krone. 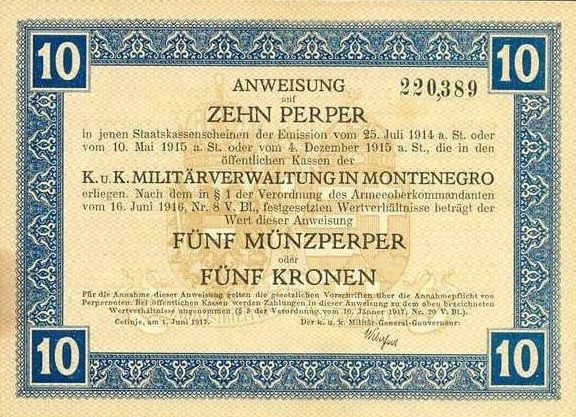 1917 Austrian occupation of Montenegro – the Austrian Army issued vouchers which temporarily replaced the local currency. At the end of the 20th century, Montenegro contemplated issuing the perper again. However, it decided to adopt the Deutsche mark instead, and later followed the change to the euro. As such, the newly independent Republic of Montenegro now has no currency of its own. The European Commission and the ECB have since voiced their discontent over Montenegro’s unilateral use of the euro on several occasions. The EU insists on the strict adherence to convergence criteria (such as spending at least 2 years in the ERM II system) which are not negotiable before euro adoption, but have not intervened to stop the unilateral use of the euro by Montenegro. Officials from the Central Bank of Montenegro have indicated on several occasions that the European institutions do expect them to strictly follow ERM rules, particularly because of their EU accession process. On 17 December 2010, Montenegro was granted candidate status to join the European Union. The currency issue is expected to be resolved through the negotiations process. Unlike official members of the Eurozone, Montenegro does not mint coins and therefore has no distinctive national design.